People love to rank stuff. Everyone wants to know what's the best, what's the worst, and everything in between. Personally, I'm wary of top 10 or top 100 lists, even though I've made a few on occasion. One website that has lists I've found useful is Tripadvisor.com. I use it a lot for making travel plans. I often check their hotel rankings. They are based on extensive user grading and feedback, and they've helped me find some real gems. I also volunteer advice on their Prague forum. But I've been intrigued and bothered for a long time about their restaurant rankings. Right now, La Degustation is in first place. I've never been to this expensive epicurean eatery, but from what I've heard, it's deserved. Artisan recently leapt up to the number two spot. Rankings change pretty regularly, based on member responses. There are other worthy, though expensive entrants, with V Zátiší and La Finestra in Cucina coming at six and seven, respectively. 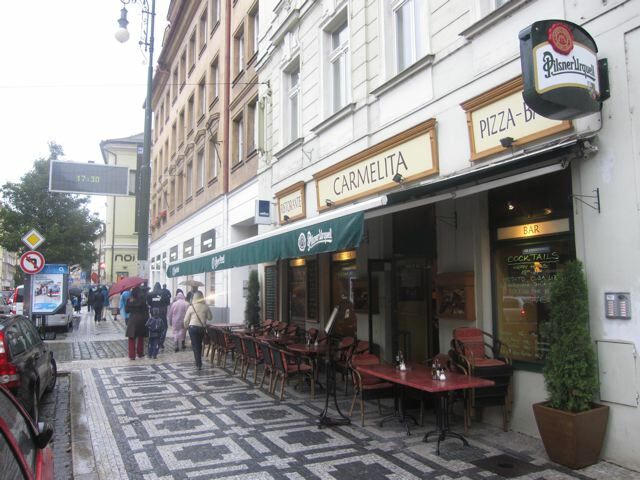 But the current number three is an Italian place called Ristorante Carmelita on Ujezd. "That place?" I thought. I've passed it hundreds of times on the tram but barely even noticed it. Given the location and the fact I'd never heard any mention of it I just assumed it was a typical tourist spot. People wrote reviews using words like "fantastic" and "wonderful" and "fabulous." 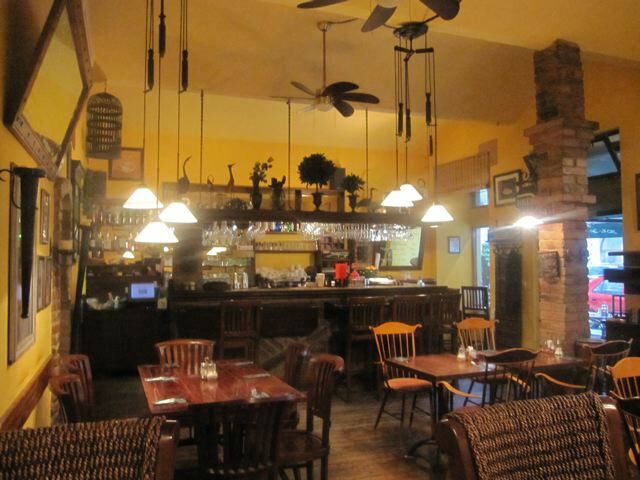 The restaurant is one of the most-reviewed on the list. And I don't think the writers are shills. I had to see for myself. 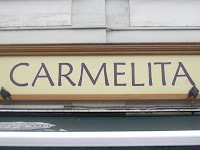 My schedule's been hectic lately and I've had trouble coordinating with friends, so I made three solo visits to Carmelita. The dining areas do have a warm feeling, with worn wood flooring, brick walls, lots of browns and yellows, and Pottery Barn-style kitsch. An Italian crooner was on the sound system. I belatedly discovered the upstairs section is for smokers when the people at the table next to me asked for an ash tray. I started with a .4 liter glass of Pilsner Urquell (43 CZK). It tasted fine. Perhaps some people aren't aware that it's not a half-liter glass. I'd prefer the larger size. 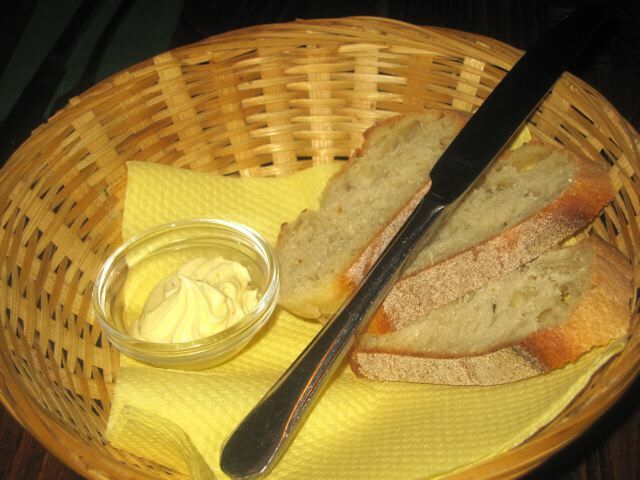 Three slices of bread arrived with soft, seasoned butter. They looked a little lonely in the big basket. The bread was good quality, but also chewy and not the freshest. The short list of starters was pretty standard and basic: beef carpaccio, salmon tartare, bruschetta, and Parma ham with mozzarella. I settled on the grilled goat cheese salad with grilled vegetables (169 CZK). Not good. The warm, tangy cheese itself was fine, but I don't award many points for selecting and heating cheese properly. Everything else was just sad. Given the decent bread I had in the basket, I couldn't understand why they'd park the cheese on top of that cheap, white, supermarket toast. 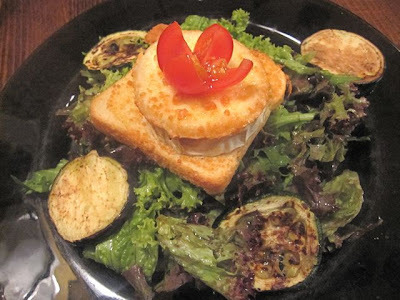 The "grilled vegetables" consisted of two dry, pan-blistered slices of eggplant and two slices of zucchini with no discernable seasoning. Under that was water-soaked, undressed lettuce. There was oil and balsamic vinegar on the table for me to dress it up. 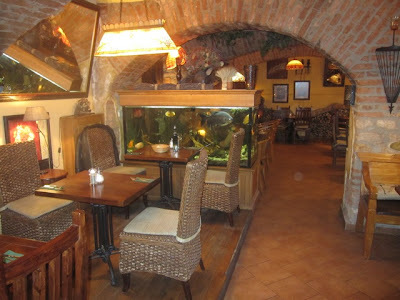 For a main course, I picked my regular favorite and what I had last week at Mirellie in Vinohrady: the risotto frutti di mare (169 CZK). 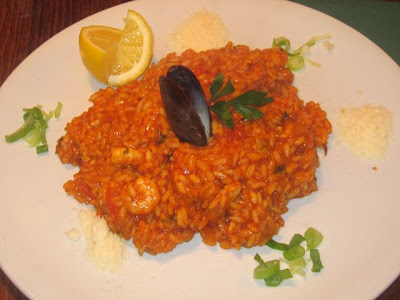 The rice was cooked properly and al dente. It was a very generous and filling portion. There was also onion and leaf parsley. The low price is hard to beat. But there were plenty of problems. There was an overabundance of tomato sauce mixed in that was really too sweet for me. The seafood itself wasn't good. The shrimp were small and overcooked, and most of the calamari was rubbery and fishy. Oddly, a few of the rings were more tender and tasted fresher. The mussels, without shells, also seemed past their prime. This risotto may look like others I've had around town, but Mirellie's and Kogo's are far superior. 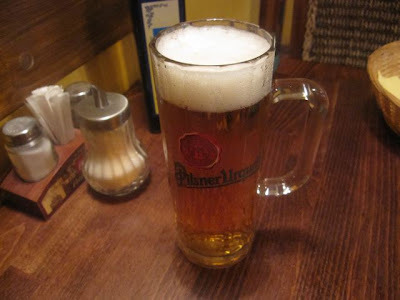 I paid 380 CZK without tip for this first trip. I didn't get quality, but I definitely got quantity. I couldn't even finish the risotto if I had wanted to. On my second visit, I went downstairs. The warm design is the same as upstairs. On one side of the room is their wood-burning pizza oven. 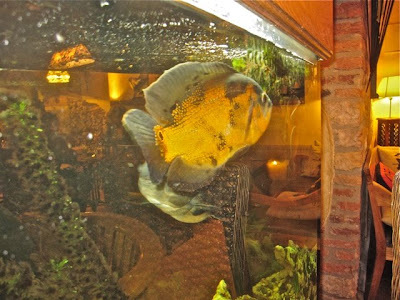 One thing that many travelers take special note of is the fish tank. There are some large, colorful specimens in there. I decided to see what they could do with the bruschetta (89 CZK). This time they used the good bread underneath. The fresh tomato and basil, with a touch of vinegar, was fine if uninspiring. 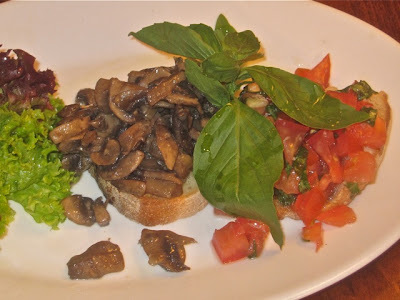 The other bruschetta really had no other flavor beside the most basic type of mushroom. It was totally bland and boring and needed salt. 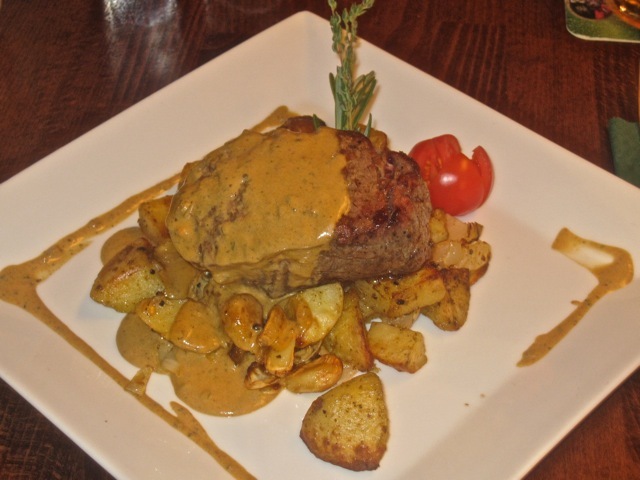 I'd read a review by one traveler who raved about the steak, so I ordered the beefsteak, green pepper sauce, and roasted potatoes (369 CZK). At last, I found something to agree on with the tourists. It was great. The meat was amazingly tender. I could easily cut the most beautiful slices with the less than sharp steak knife. The beef was cooked perfectly medium-rare as requested, which brought up its excellent flavor. I loved the crispy, buttery potatoes underneath. 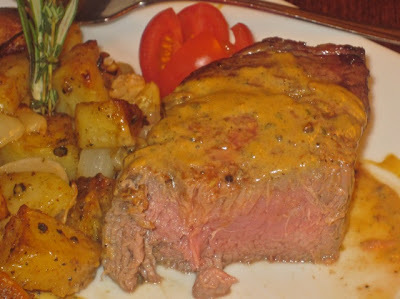 The only fault I found was with the creamy pepper sauce. Initially, it tasted too salty, but I got used to it after a few bites. In the end, I cleaned my plate. As full as I was, I still decided I needed to eat a dessert. 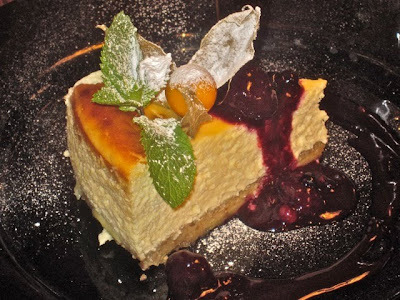 I ordered the ricotta cheesecake (79 CZK). For some reason, I imagined I'd get a dainty little slice, but it was a huge piece, covered with a dark berry syrup-compote. This cheesecake was fantastic. The waiter assured it me it was homemade. The dessert was light, creamy, not overly sweet, and had the clear texture of ricotta I was hoping for. I wish there were more ricotta-based desserts in this town. The bill for this visit was 580 CZK without tip. I went back one more time, and since the weather was fine, I sat out in front. 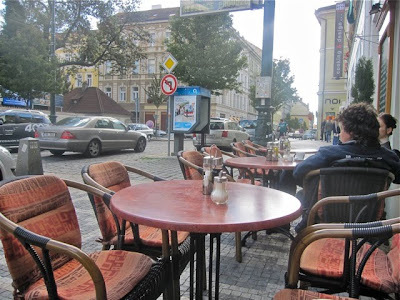 It's pretty noisy with all the cars and trams going by, but also a good spot for people watching. 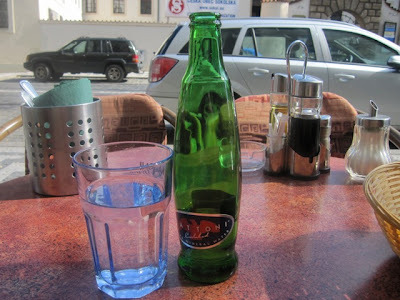 I asked for a .33 liter bottle of Mattoni mineral water. It was room temperature, not chilled. I hate that. I had to check out one last item that got a lot of positive mentions: the pizza. 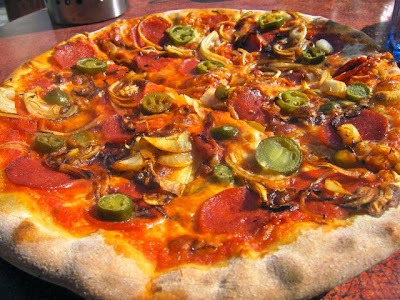 I ordered the "Messicana" which comes with onions, pepperoni, jalapenos and I asked them to leave off the egg on top (152 CZK). These toppings are rather overwhelming, flavor-wise. So I made sure to get a good taste of the tomato sauce by itself. It tasted of tomato and salt and not much else. Just OK. The cheese was unremarkable. The crust was a serious weak point. It was thin, chewy, boring, and the kind you'd find at dozens of other generic pizza places around town. I had a couple of good dishes, but my overall assessment is that Ristorante Carmelita is nowhere close to deserving even a top ten ranking among Prague restaurants. Yes, their prices are very good for a prime tourist area. They don't skimp on portions. Service was efficient enough. It's not a bad looking spot. I can understand tourists being relieved at finding such a place, after all they've heard about rip-off restaurants in Prague. And of course, they don't know the many better quality places that aren't in the tourist zone. Still, I'm left mystified. Why is it that Carmelita has 95 user reviews on Tripadvisor, and its next-door neighbor, Luka Lu, only has one review and is ranked 409th out of 964 restaurants? By my reckoning, Luka Lu is clearly a better restaurant overall. 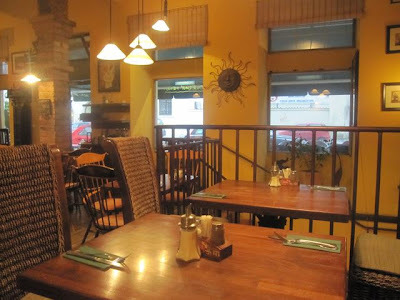 The food is much more consistent and tasty, the prices are similar, and the outside seating in its back garden is better. Lists can be useful at times, but this type of disparity makes this ranking rather unreal for me. My advice: Don't believe everything you read on the Internet. 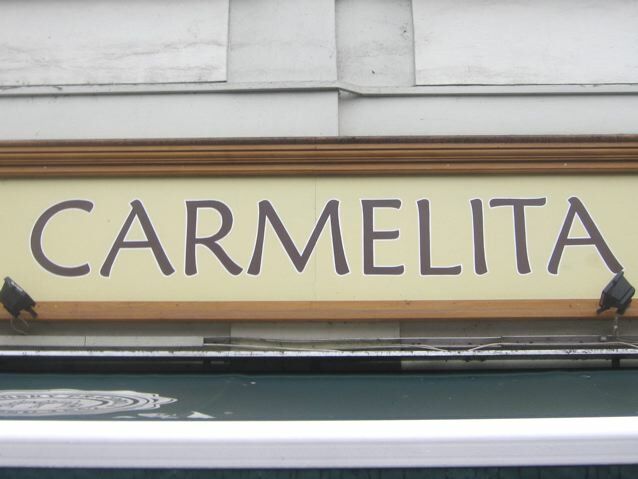 Why is it that Carmelita has 95 user reviews on Tripadvisor, and its next-door neighbor, Luka Lu, only has one review and is ranked 409th out of 964 restaurants? 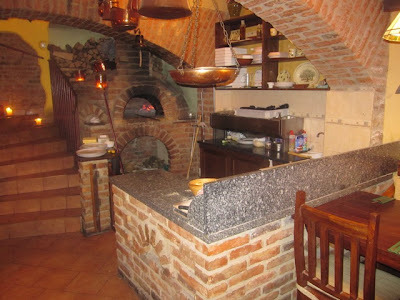 Because an awful lot of tourists want something familiar, or something their children will eat willingly, and they've heard of pizza but haven't heard of Yugoslavian food. Yes I am going to Luku Lu on my next visit. In the area I really Like La Bastille. Many Czech people eat here, especially in the Evening.